This Christmas I'm making more of an effort to shop from local and independent businesses. It is all too easy using my Amazon Prime to have things delivered next day but I'm not sure how much satisfaction I get out of it. 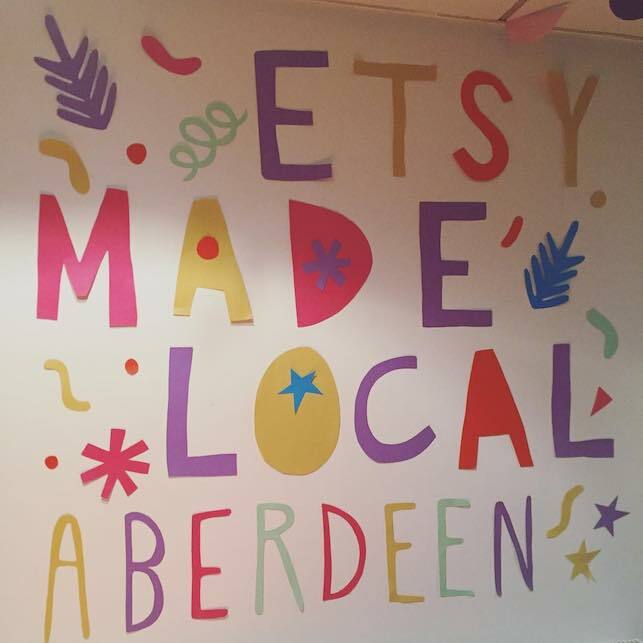 My shopping local trial starting with a trip to Etsy Made Local Aberdeen on Saturday afternoon with my flatmate. There was some really great local designers there who caught my eye so I decided to share five of my favourites on my blog. I didn't walk away from the market with lots of presents sadly. I picked up a Christmas card from Claire Paul Illustration for my boyfriend but apart from that I like to think things over and properly consider the gifts I'm going to give. Claire's stall caught my eye as soon as we got to the market. Her illustrations are right up my street - my mum would like one of her iphone cases (annoyingly she doesn't have an iPhone though) and I like the polar bear card so I bought it for my boyfriend. My flatmate picked up a beautiful diamond print from her too. She shares lots of her work on Instagram so go check her out! Another stall close to Claire's was Laura from Juniper Press. Again I loved her illustrations - especially the camera print which would be perfect for me. If you've got a gin lover in your life (unfortunately I don't) then they would be perfect. I also really liked the little wooden badges she had which would be perfect little gifts. Small Stories Scotland had some great gifts with an Aberdeen theme. I especially liked the wooden decorations and the enameled pins. If I had a baby to buy for the clothes with Aberdeen sayings like 'Fit Like' and 'Loon' on them were really fun. Can you tell I've got a bit of a thing for prints at the moment? If only I had unlimited space to hang them up. I loved the stamped birds in Jenny's collection - my mum would love them too (in fact I regret not buying her a Christmas card). She has a giraffe print too which caught my eye. Plus the little felt birds which could have a place in my home any day. Last but definitely not least are the ceramics from Gavin - I'm going through a phase for tea light holders at the moment and these designs were definitely beautiful. Sadly these pieces are out of my student budget but if you are looking for something special I'd definitely take a look at his shop. From what I've seen on social media there looks like there was some great makers there on the Friday and the Sunday I couldn't make it too. I can't wait for next years event already.